I must admit that I was first to hate on the hiring of UCLA coach Jim Mora, but I should have known better. The Bruins took a page from their nemesis USC and gave their job to a former NFL has been who could not get a job anywhere else. Can you say Pete Carroll boys and girls? After striking gold Carroll left the scarlet and gold high and dry amid recruiting scandals that set the program back for three years. But, he did so after leading the Trojans back to national prominence, cashing in with the hapless Seahawks. Mora might be next to follow such a pattern. 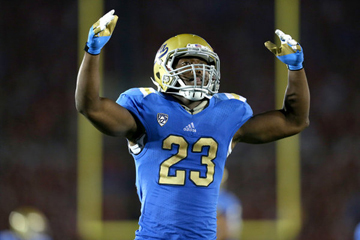 He made a bold move and started the first African American quarterback in UCLA history and boy has it paid off. 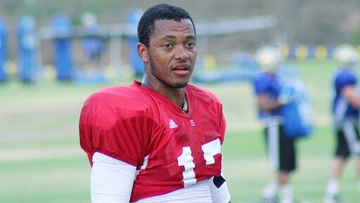 Brett Hundley a bulky 6’3 red shirt freshman from Arizona has already completed 42 of 61 passes for 507 yards and 6 touchdowns. Heck that’s better than Heisman hopeful Geno Smith of West Virginia who has completed 32 of 36 for 323 yards. Mora also has a Heisman candidate on his team in senior running back Johnathan Franklin, the leading rushing in the nation with 431 yards. Franklin out of Dorsey is averaging 10.5 yards per carry and four rushing touchdowns. And, oh by the way it’s no fluke that UCLA is 2-0 on the season and already saying bring on the Trojans. Franklin played for my homey Paul Knox at Dorsey who does not receive nearly the credit and respect that he deserves coaching the Dorsey Dons. Two of the best high school coaches in the nation are both in the same league in Knox and my former junior high and high school mate Robert Garrett of Crenshaw. Franklin played line backer and running back at Dorsey during a senior year in which he was All City and the Coliseum League Player of the Year. Another Heisman candidate in the Pac 12 is former Crenshaw star De Anthony Thomas who has 166 yards on 10 carries for the Oregon Ducks. 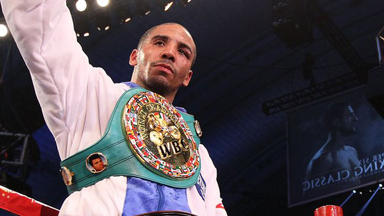 Enough of football… Did you see that beat down by Andre Ward last Saturday on HBO? For a minute I thought I was getting a fight that should have been on Pay Per View until that boy Chad Dawson came out looking like he was hungry for a meal. Then Ward just bullied and mauled him like a pit bull until the fight was stopped in the 10th round. Finally, I think you know my transformation from Raider fan to Raider hater. I saw my boy Huey Jackson on the sideline coaching with the Bengals and that kid Raider coach bumbling with the Raiders on Monday night. The Bengals and Raiders probably would have been a more competitive game than the way ESPN had it scheduled. Two blowouts… No wonder their ratings are in the toilet.